This annual colloquium, inspired by the School of Engineering Education's boundary-crossing Interdisciplinary Engineering (IDE) program, presents a topical subject and invites perspectives from engineering and a range of other fields, including the humanities, the social sciences, and education. Drawing speakers from our diverse alumni base, the event highlights the enormous potential of our school to work with industry. Our core research expertise is about engineering learning—expertise that is central to creating a more innovative technical workforce. We look forward to involving IDE alumni in this exciting work. Supported by the PROFESSOR BRUCE JOHNSON GRADUATE EDUCATION FUND. 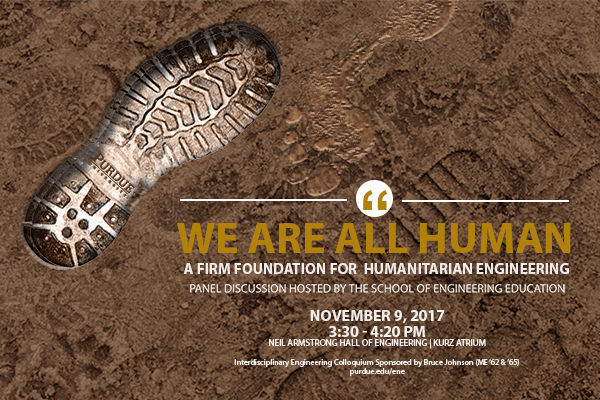 2017: "We are All Human"
On November 9, 2017, Purdue University College of Engineering Faculty Panelists Jennifer DeBoer, Brent Jesiek, and Ayhan Irfanoglu discussed the nature of humanitarian engineering across engineering design initiatives, emerging economies, and as global competencies and challenges. 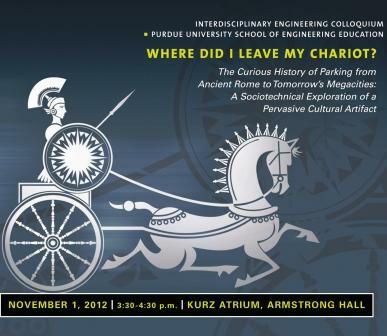 Why Humanitarian Engineering at Purdue? The answer is simple and exists in our motto – students first. Student demand is up for humanitarian work. They are witnessing the world around them through study abroad opportunities and engineering projects in community service within their professional schools and in programs like the Global Engineering Program and EPICS. Why not Purdue? Our mission to transform engineering education based on scholarship and research rests on three pillars: re-imagining engineering and engineering education, creating field-shaping knowledge, and empowering agents of change. Purdue Engineering students have access to a wealth of knowledge with world-renowned researchers right here on campus, across the many disciplines of engineering and beyond. Solving today’s multifaceted challenges requires a degree program with flexibility to adapt. Offering the most free electives, Multidisciplinary Engineering degrees allow students to thoughtfully create a plan of study to target and succeed in specific areas of interest (Water, Sanitation, health, etc.). No matter how narrow or broad their interests, Humanitarian Engineering answers the call for students with an opportunity in mind. Collaboration between the Colleges of Engineering and Liberal Arts began with just one student* graduating with an interdisciplinary engineering degree in 1975. Over forty years later, hundreds of Purdue Engineering alumni have benefited from what began as an idea to provide better opportunities for students interested in sound and theatre. This colloquium celebrated the history, milestones, and those vested in the progress. Perspectives from faculty, alumni, industry leaders, and current students were all incorporated in the hour-long program closing with a pair-and-share networking segment. Interim Head Audeen Fentiman led discussion with panelists Rich Dionne, Assistant Professor and Faculty Technical Director for the Department of Theatre in the Purdue Liberal Arts Patti & Rusty Rueff School of Visual Performing Arts and Ian Boze, Technical Director for the Department of Performing Arts at the University of Florida. Ian is a 2011 graduate from the Purdue University Engineering Education’s undergraduate degree program with a degree in Multidisciplinary Engineering with a concentration in Technical Theatre Engineering. Rich and Ian shared their stories, including how the ABET-accredited program has provided opportunities for engaging liberal arts and engineering students in a classroom setting, early challenges, and beneficial outcomes. This meaningful discussion offered helpful insight for other colleges and schools at Purdue University who plan to form similar collaborations. *More about our first acoustical engineering graduate, David Schwind, with areas of study that included Mechanical Engineering, Electrical Engineering, Physics, and Design. David was also our 2002 Outstanding Alumni Honoree and a 2011 College of Engineering Distinguished Engineering Alumni. Moderated by Dr. David Radcliffe, Kamyar Haghighi Head of the School of Engineering Education, the 2015 colloquium featured a panel discussion and video segments from the Purdue College of Engineering Professors of Engineering Practice. Interdisciplinary work depends upon ‘boundary agents’ - individuals who can operate effectively across the boundaries between different disciplinary silos. 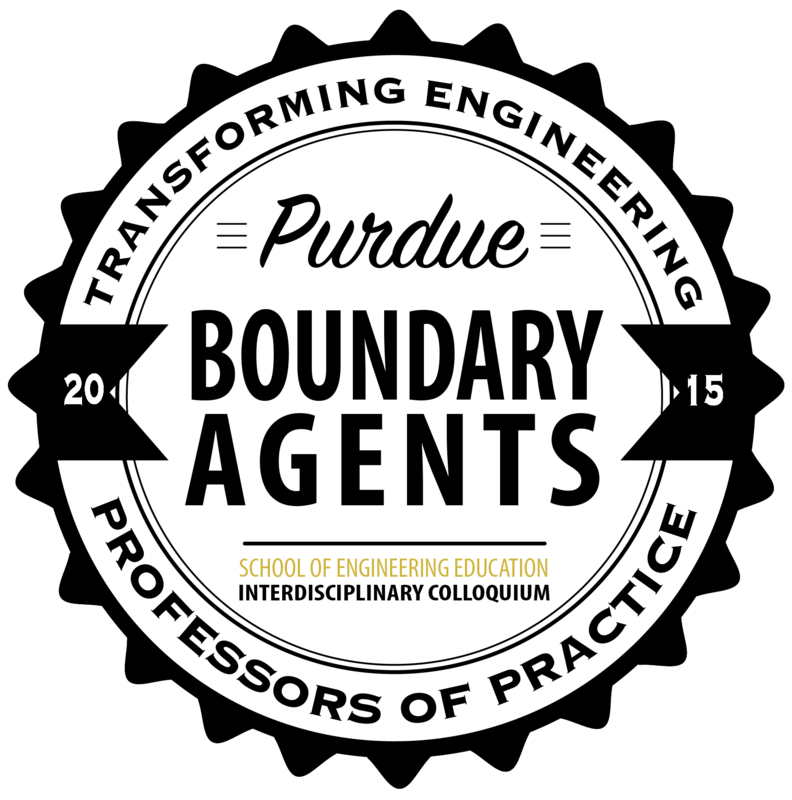 Because work in industry is not organized along the traditional disciplinary boundaries that define the schools of engineering at Purdue, Professors of Engineering Practice bring an inherently interdisciplinary perspective. They can share not only their expertise in the classroom and develop engagement opportunities, but more critically they can lead in the development of new paradigms for innovative engineering practice and education. The colloquium and videos are archived in the video below. Reduce, transfer or ignore – what is the best course of action when it comes to risk? 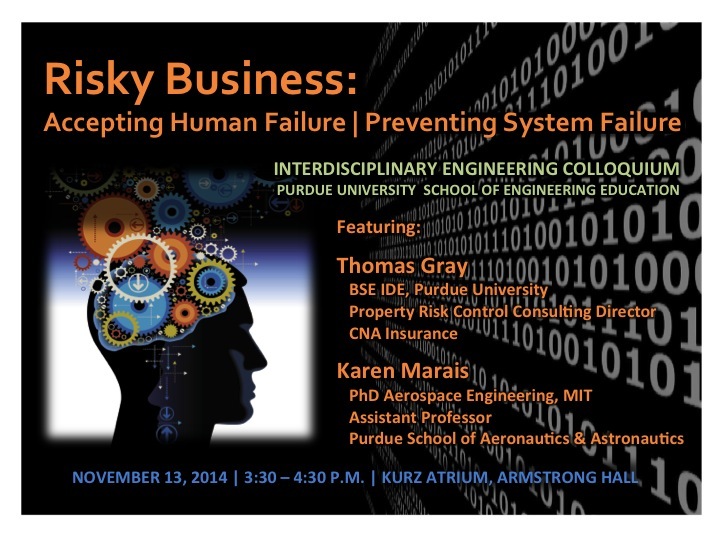 This year’s Interdisciplinary Engineering Colloquium, hosted by the Purdue School of Engineering Education and titled “Risky Business: Accepting Human Failure; Preventing System Failure,” examines the issue from the perspective of the insurance industry and scientific research. Panelists were Tom Gray, Property Consulting Director, CNA, and Dr. Karen Marais, Assistant Professor, Purdue School of Aeronautics and Astronautics. Gray, who graduated from Purdue with a degree in Interdisciplinary Engineering focused on Engineering Management, has nearly four decades of professional experience in the insurance industry. Gray has worked with high-hazard industries, such as chemical and pharmaceutical companies and grain elevators, where dust explosions and flammable liquid fires are considered very high hazard risks. Marais has a background in aerospace engineering and researches system safety and risk analysis. Marais will present a history of our understanding of failure and what steps could be taken to improve a situation. David Radcliffe, Kamyar Haghighi Head, School of Engineering Education, served as the moderator. You can view the video here. The 2013 colloquium kicked off the 10th anniversary celebration of the School of Engineering Education. We were pleased to offer a look back at the scholars and researchers from the 1950s onward who helped lay the foundation for the thriving discipline of engineering education and the School of Engineering Education at Purdue. Before and after the colloquium, you also had the first public showing of Transforming Engineering Education Through Scholarship and Research, a video celebrating the mission and impact of the School of Engineering Education in its 10th year. David Radcliffe, Kamyar Haghighi Head, School of Engineering Education, served as the moderator. A recorded video with William LeBold, Professor Emeritus of Engineering, Director of Educational Research and Information Systems, was included. You can view the video HERE. Titled "It Takes a Team: Reflections at the 50th Anniversary of Human Spaceflight," the 2011 colloquium featured IDE alumnus Gary Horlacher (NASA shuttle flight director) and Purdue history professor Michael Smith on the geopolitical and societal context and technological challenges of the Space Race in the early 1960s, the human and technological systems in the space shuttle era, and the lessons to be learned for the future exploration of space. As moderator David Radcliffe, ENE's Kamyar Haghighi Head, noted, it truly took a team, exhibiting "engineering vision, political courage, and unity of national purpose" on both the American and Soviet sides, to embark on the adventure of human spaceflight. The colloquium, inspired by ENE's boundary-crossing Interdisciplinary Engineering program, was co-hosted by Purdue's Colleges of Engineering and Liberal Arts and took place, appropriately enough, in the atrium of the Neil Armstrong Hall of Engineering, where a replica of Gus Grissom's Apollo 1 command module is suspended from the ceiling. For more on the 1961 spaceflights of Gagarin, Shepard, Grissom, and Titov, see The Purdue Alumnus (July/Aug '11), page 34, "First Humans in Space."